The Roman Empire was born after the dictactorship and assasination of Julius Caesar in 44 BCE. Conquest was an important aspect of the Empire, and in the second century CE, Emperor Trajan (or Traianus, in the original Latin) and his forces conquered Dacia, the area north of the Danube River, resulting in the largest Roman Empire to exist. In contrast, after the fall of the Roman Empire by Vandal and Ostrogoth invasions around 500 CE and fifteen hundred years of medieval and industrial history, Rome is now a metropolitan city in the country of Italy, probably marking the smallest borders of Rome since its founding. After a successful attack on the Greek colony of Tarentum in modern day Italy, the Greek and Carthiginian colonies on the Italian peninsula islands were left vulnerable. The First Punic War, around 250 BCE, was a battle for the complete control of the Peninsula and Sicily; Rome eventually gained complete control of Italy during the course this war. This, however, made an enemy out of Carthage. During the Second Punic War in 218 BCE, General Hannibal of Carthage attacked Roman territory, most notably at Cannae. Hannibal did not attack Rome, however, because of its massive fortifications. This gave Rome a great advantage, and the strategy of attacking Carthaginian territory instead ofgoing after Hannibal and his men in the Alps worked perfectly. Hannibal was recalled to Carthage where he was killed by a Roman general. 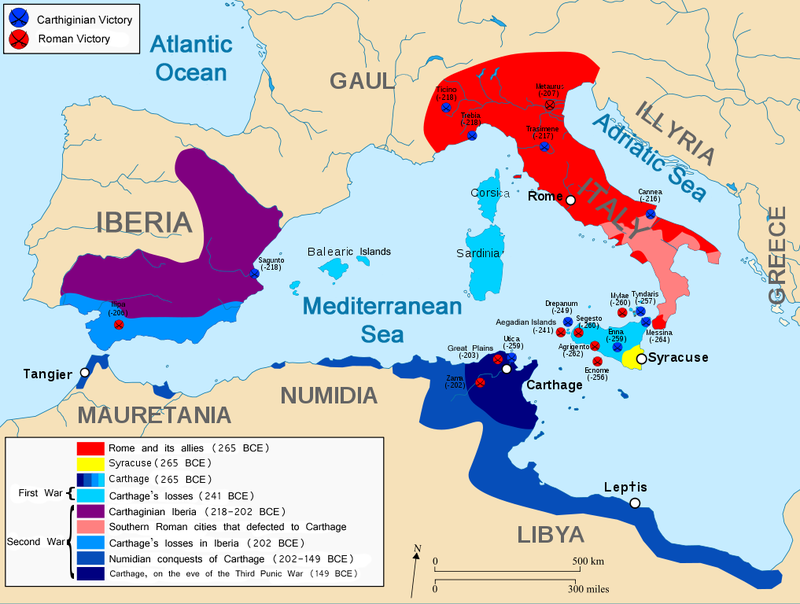 The incursion into the Carthiginian Empire created an alliance between Rome and the Numidians, who continually went on conquests of the central Punic territory. The Third Punic War, around 150 BCE: a full-scale Roman invasion of Carthage. 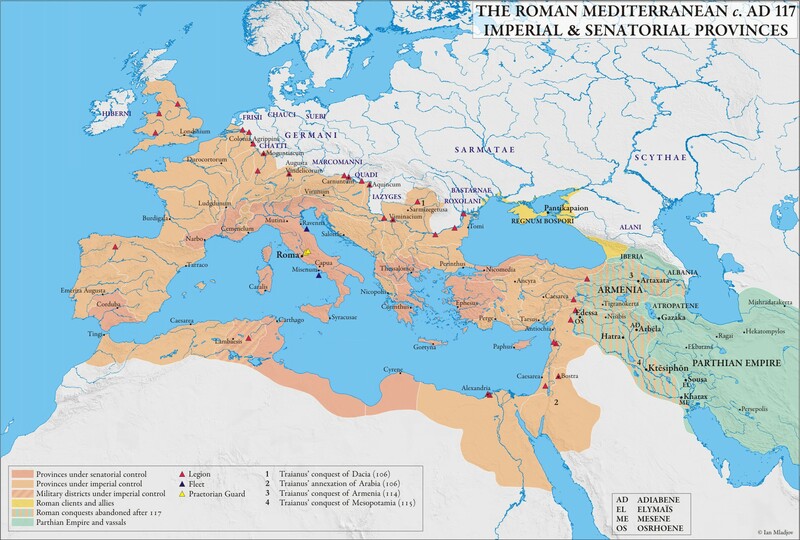 Roman troops entered the Carthiginian Empire, and eventually conquered the city of Carthage. The city was burned to the ground, the lands de-fertilized and the Punics were killed and captured. The Punic territory is added to Rome, extending the Roman Republic to Tunisia, parts of the Iberian Peninsula and all of Sicily. 1) The invasion of Carthage was very important, as it proved the Roman Republic the ruling state of the Mediterranean. The Third Punic War also gave Rome a foothold in Africa. The Greek Ptolemaic Empire in Egypt had sided with Rome, and many other alliances were made during this time. 2) The invasion of Syracuse drove the Greeks off of Sicily, and probably proved Italy and Sicily entirely the territory of the Roman Republic. 3) The attack on Cannae by Hannibal probably started the Second Punic War, which gave Rome a lot of Carthiginian territory near Carthage. Ancient Roman industry started after the Punic Wars, which brought Roman expansion over Spain, Greece and parts of Africa. Slaves and prisoners were cheap labor, and many weapons, ceramics and materials were sold along trade lines to China and India. After the conquest of Britain and Gaul, many minerals and agriculture from the north were sold in the southern parts of the Empire. Water was transported from mountains by aqueduct to Rome, and any waste was dumped into rivers downstream from any major cities. The Romans are probably famous for their functional—not to mention amazing—aqueducts. Rome is not a very industrial city anymore. Most of the Roman workforce is in government, commerce or tourism. Of the Romans that are in industry, most of them are in clothing and processed food factories. Most of the factories near Rome are northwest of the city. Rome is now the capital of Italy, a First-World country. Italy was a founding member of the European Union in 1952. The ancient Romans of the early Republic of circa 500 BCE normally buried their dead, but towards the end of the Republic, cremations became popular. In around 300 CE, with the spread of Christianity, burial once again was common. Coins were placed on the tongues of the deceased, as in Greek beliefs, so that the dead would be granted passage across the River Styx to the Underworld of Pagan Greco-Roman mythology. Pagan Romans buried household items like jewelry, pottery, clothing, weapons and even food for the dead for their eternal stays in the Underworld. Nobles and emperors were able to afford large tombs with burial chambers. 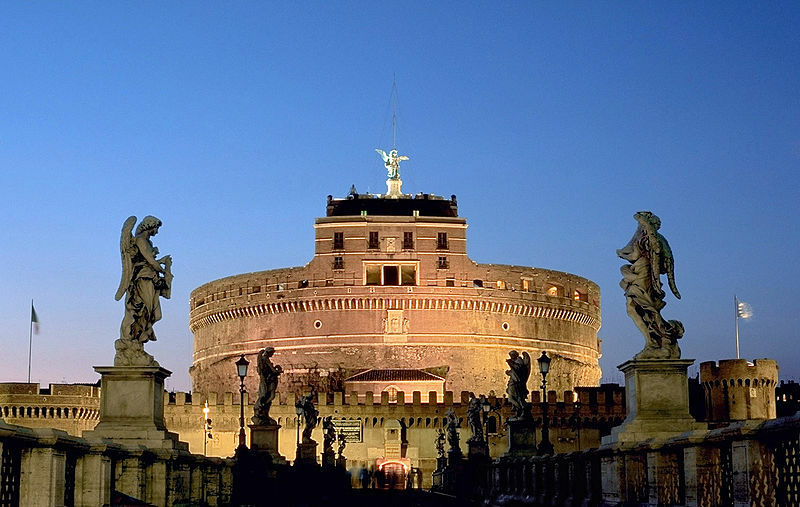 One such example is Hadrian's Tomb—now known as the Castel Sant'Angelo—which still stands over the Tiber River in Rome. Today, Catholism is the main religion of Rome. The "headquarters" of Catholism is Vatican City, a country (about 0.2 square miles in size) inside the middle of Rome. Burial rituals depend on the wishes of each individual person. Flowers and items that were important to the person are sometimes placed over their graves or, sometimes, actually buried with them. The ancient Romans had a family system called patria potestas, which states that the father has absolute control over the household, children, wife and slaves, even to the power of life and death. The mother was not given this amount of power; she was somewhat of a bystander in the family. The marriage of a nobleman and a noblewoman wasn't usually love, it was usually an alliance between their two families. The wife did have an ability to retreat from a relationship, however it would mean going back to the control of her father. For normal citizens, marriage was usually just an agreement between a man and a woman to live together. Couples would usually dine together and women were allowed to go out in public, unlike in ancient Greece. Nowadays, gender roles have evened out. Women and men both have power over their families, and marriage is usually about actual love.